Congratulations to Sgt. 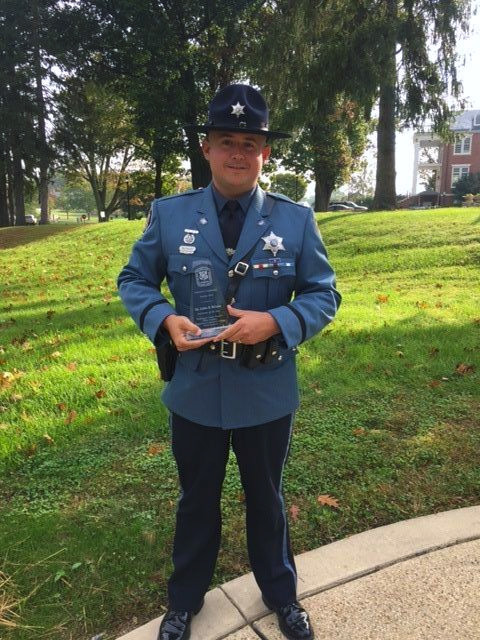 Josh McCauley for being named as the Washington County Sheriff’s Office’s Instructor of the Year. Sgt. McCauley was presented with this award at the 16th Annual Instructor’s Awards and Training Conference in Sykesville, MD. On 10/7/16 units were dispatched to a residence on Porterstown Rd. Keedysville, Md in reference to a juvenile female who had been injured falling from a moving vehicle on a public roadway. Investigation revealed the juvenile female was a passenger in a truck operated by her boyfriend travelling east on Shepherdstown Pike. The juvenile female fell out of the passenger side door while the vehicle was in motion. The boyfriend got her back in the vehicle and drove her to her parent’s home. EMS units were dispatched and determined the juvenile female had serious injuries and needed to be flown to Shock Trauma for treatment. Keep up the good work DFC Hardy! Dfc. Ron Hardy is a local celebrity here… especially during 6th grade lunch! 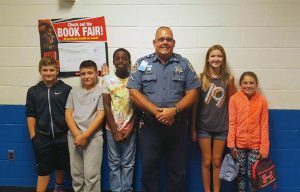 We appreciate the daily support he provides us and would like to thank him and the rest of the Washington County Sheriff’s Office for all they have done this week to make us feel safe. Media Release: Williamsport High School student charged in connection to second social media threat towards schools. Williamsport High School student charged in connection to second social media threat towards schools. On October 2, 2016, the Washington County Sheriff’s Office investigated social media posting threatening several schools located in Washington County. The investigation involved a post that had been made on Facebook from an account that identified itself as “William Hall (Williamsport clown)” the poster claimed that they were going to go to several named schools in Washington County and kill students. That investigation identified a juvenile female suspect who resides in Westminster, Maryland as the person responsible for the posts. In the evening hours of October 3, 2016, the Washington County Sheriff’s Office was again advised that there had been more postings on Facebook, similar in nature to the ones previously investigated the night before. These posts were made by a Facebook profile that identified itself as “Hager William”. Investigators were able to trace the IP address used to create the Facebook page back to a cell phone located at a residence in the Fairplay, MD, area. After making contact with individuals at the residence and further investigation, Deputies determined that a 15 year old female, who is a student at Williamsport High School, was responsible for the posts. During the afternoon of October 4, 2016, the Sheriff’s Office received information that an additional “Hager William” profile was active and was implying that they would be at previously named Washington County Schools. Investigators were able to trace the IP address used, which returned to a doctor’s office located in Frederick, Maryland. After further investigations, Deputies learned that the juvenile female was at an appointment at the same office as the IP address. The Wi-Fi was available for public access at that located. It was determined that the same juvenile was responsible for the additional posts. On October 5, 2016 the juvenile was placed under arrest at the Washington County Sheriff’s Office. The juvenile is charged with 1 count of Disturbing School Operations, 4 counts of Attempted Disruption of School Operations and 1 count of Obstructing and Hindering. Updated information; Jenna Beatty has been located safe. The Washington County Sheriff’s Office is currently looking for a missing 15 year old female. Jenna Beatty was last seen on October 11, 2016 at approximately 4:30 PM in the area of Northern Avenue, Hagerstown. Jenna is 5’2″, 125 lbs with blonde hair. Anyone with information on her location is asked to contact the Sheriff’s Office.